Opti-Free Express Twin Pack solution is an all-in-one multi-purpose solution from Alcon & Ciba Vision that is a highly convenient option to clean your soft contact lenses. No rub routine needs to be followed with this Opti-Free Express value pack solution, which features a triple-action formula. This works by cleaning, disinfecting and conditioning your contact lenses, as well as storing them overnight. Opti-Free Express solution provides a high level of hygiene and freedom from the build-up of irritants. In addition, by no longer needing to rub your contact lenses, this means that there is less chance of you damaging them during the cleaning routine. The unique solution works to clean and moisturise the lenses, even after you’ve put them in. The formula enables the lens material to retain moisture. As such, you can be sure that your lenses are kept lubricated and will be comfortable to wear for the whole day. 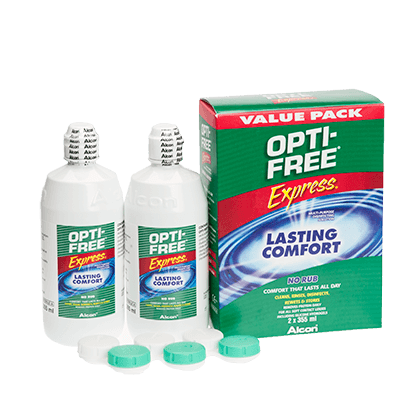 This value pack means that you can save money while you save time with this contact lens cleaning solution at FeelGoodContacts.ie.